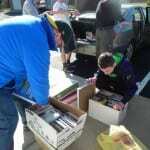 Flemington, N.J. – The Spina Bifida Resource Network (SBRN), a nonprofit agency located in Flemington, is collecting used books to raise funds to support services for children and adults with disabilities. SBRN is working with New Legacy Books to collect used books in good, readable condition, which will then either be resold or recycled. Part of the proceeds is donated to SBRN. Hardcover, paperback and textbooks are accepted as long as they have a ISBN barcode label on the back cover. Books can be placed in the large green bins located in the back parking lot of the “Old Egg Auction” complex, at 84 Park Avenue, Flemington. “We are very excited to work with New Legacy Books to help support children and adults living with spina bifida and other disabilities. It’s an added bonus that we are helping the environment by re-using or recycling all of these books,” said SBRN Executive Director, Roberta Kestenbaum. Anyone who has used books can donate. SBRN is also looking to work with volunteers who want to hold book collections. “This is a great opportunity for Scout troops, school or youth groups who would like to do a community service project,” noted Laura Larice, SBRN Administrative Assistant. Anyone interested in doing a book collection should contact SBRN at info@thesbrn.org or 908-782-7475. The Spina Bifida Resource Network has provided specialized nursing and care coordination to families of children and adults with spina bifida in New Jersey for over 30 years. Spina bifida is a birth defect of the spine which limits mobility and affects daily living. SBRN works with individuals with disabilities to achieve greater health and independence and also educates the public on folic acid’s role in preventing this permanently disabling birth defect. Ethan Wimmer, of Lebanon, NJ recently completed a very successful book drive for his Eagle Scout community service project. 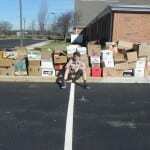 Ethan was able to collect over 5,000 books! We are very grateful for the work he did, and wanted to share some photos of his successes!